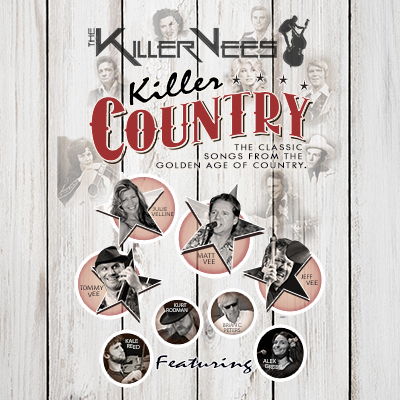 The Killer Vees Present: Killer Country! Known as the “rhythm section to the stars” The KILLER VEES have toured and performed with a virtual who’s who in the music business: Chuck Berry, Roy Orbison, Paul McCartney, Little Richard, Jerry Lee Lewis and Ronnie Wood just to name a few! Coming from a musical family of the late Bobby Vee, the KILLER VEES are joined by Matt’s wife Julie Velline on vocals, Brian C. Peters on steel guitar, Kale Reed on fiddle, Alex Green on vocals and guitar king Kurt “Lightning” Rodman. It’s going to be a high-energy rockin’ country night!